The masses have spoken – actually cried out-“VeGiiiiina, please blog about a veggie we can actually find in our local grocery store!” – So, this week -in honor of all of you whiney pains in the asses – I will write about the New Jersey state veggie, the zucchini. WHAT!! You didn’t know zucchini is famous in NJ? Well dear, have you never been to the Garden State in the Z’s peak growing season? Imagine, Produce Pete, home farmer extraordinaire, coming home from work on a hot August afternoon to pick his daily crop of 35 zucchinis. That means Pete’s wife, Produce Petunia must overwhelm her co-workers, family and friends with zucchini quiche, zucchini bread, zucchini soup, zucchini pie, sautéed zucchini, zucchini with pasta, zucchini and rice, Asian zucchini, Spanish zucchini, fried zucchini, jumbot, zucchini gumbo, zucchini dildos, pickled zucchini, zucchini jello, etc. You get the zucchini point! When zucchini season FINALLY ends New Jerseyans swear the little green prick off until at least mid-winter when the craving for something zucchini comes back. It’s baaaaack! The craving came one morning when my hubby rolled over in bed and whispered in my ear “hey baby, you know what I could really go for tonight… zucchini boats.” Damn, I thought maybe I can feign a headache. But, like the good wife, I sucked it up and gave into his desires. 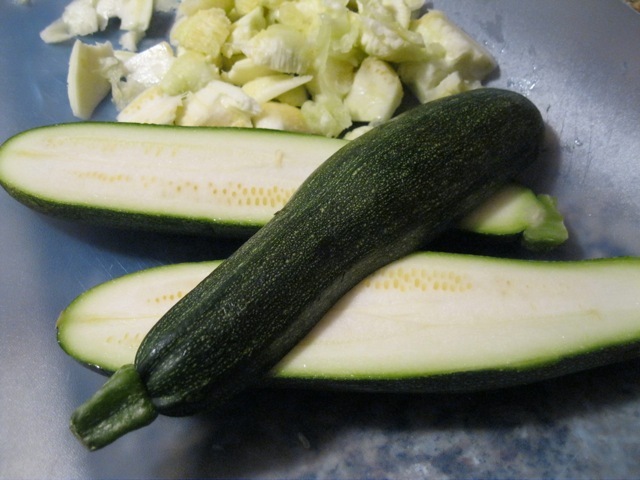 -Cut zucchinis in half lengthwise. – With a spoon hollow out the insides of each half. -Chop zucchini flesh, onions, and garlic. -Heat sauté pan with a bit of olive oil, cook chopped veggies until tender. -Add whole can of diced tomatoes, un-drained to pan, cook until heated through. – In a mixing bowl add cooked veggies, cheese, seasonings and enough breadcrumbs to bring to a stuffing consistency (liquid soaked up but not dry). 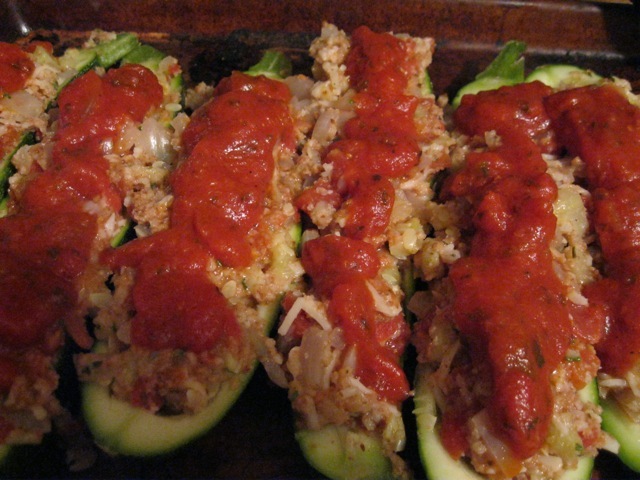 -Place in oven for 45 minutes or until zucchini bottoms are tender but not falling apart. Get on the boat – and enjoy the ride!! Happy Valentine’s Day to all you lovers and misfits! Ok, ok I get it the day has past – your flowers are a limp as Bob Dole before Viagra, your conversation hearts taste more like Tums then candy and your chocolate boxes well who are we kidding they’ve been empty since the first 5 minutes you had alone with them. Really, really – I did intended to write this post just after V-day when hormones were running high and passion was on the to do list. However, things like the full-time job and other general life annoyances got in the way. So, I decided better late than never, right. Now before you go calling him a schmuck he did something much much better for me –he cooked me a veggie recipe!!! 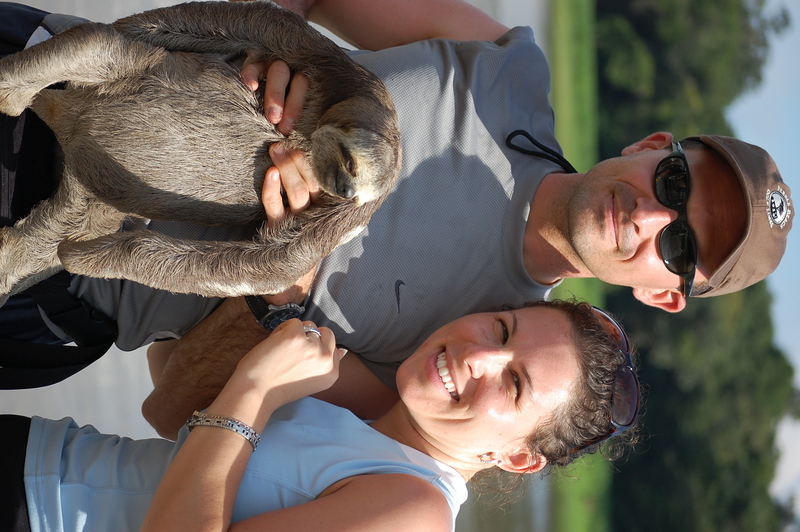 Vegicating Paul was the best Valentine’s Day gift/adventure a VeGina could ask for! Since Paul is a consummate Howard Stern fan everything, somehow, gets connected to Howie–yes, even Valentine’s Day dinner, sigh. Robin Quivers, Stern’s sidekick, launched a Veggie Blog with the help of famous chef, Gavan Murphy (copying my successful VeggieNation of course). 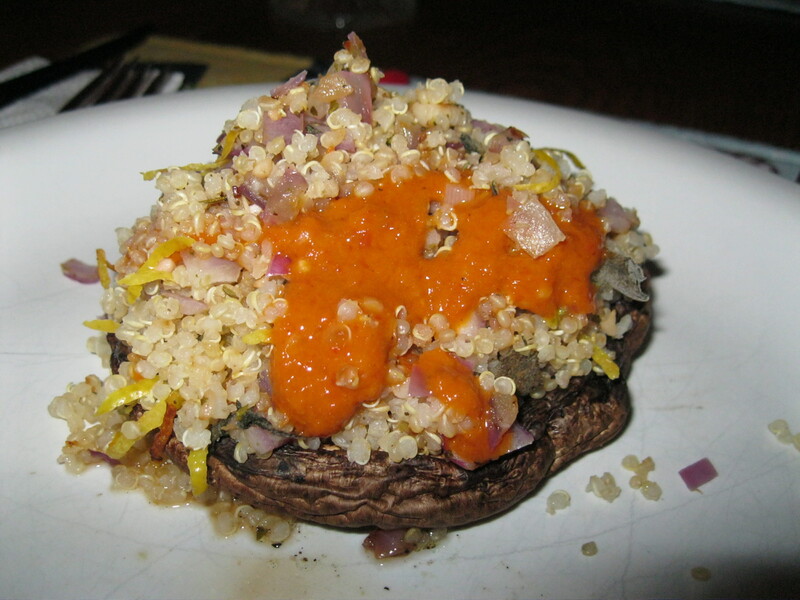 Paul selected her/his recipe for Stuffed Portabella Mushrooms to wow me with. e) my mother still sends you pity payments to be my friend. Cook the quinoa as per the instructions on the box. Drain, set aside. You can make the quinoa ahead of time or while the quinoa is cooking, preheat a medium size sauté pan or skillet on medium heat. Add olive oil and sauté onions for 30 seconds. Add garlic and continue cooking for another 3-4 minutes or until softened. Do not burn. If the onions begin to brown turn the heat down. Once softened, turn off heat and put a lid on to keep warm until needed. Next prepare the mushrooms. Remove the stem by simply pulling it out then season inside each mushroom with S&P and a nice drizzle of olive oil. Place a few rosemary sprigs inside each mushroom. The rosemary will infuse into the mushroom while cooking to add an extra layer of flavor. Preheat a large skillet or grill pan on medium heat for 1 minute (We used our BBQ grill cause it was easy!). NOTE: These mushrooms are quite meaty and absorbent so they will need some extra liquid (in this case olive oil) when cooking. Once the grill pan (or gas grill) is hot lay the mushrooms with the inside facing down. Cook for 10-15 minutes on that side then turn over and grill for another 5-10 minutes. Remove from pan to a plate until needed. Discard the rosemary sprig. In a bowl add the quinoa, softened onions, chopped herbs, and lemon zest. Mix well. Taste and season with S&P. To assemble: Place a tbsp of the vinaigrette in each mushroom. Spoon some quinoa filling on top to fill the mushroom cavity. Drizzle a few teaspoons of the sauce over. Voila! Place everything except the oil in a food processor or blender and pulse. Then with the machine running drizzle the oil to emulsify the vinaigrette. Taste. This vinaigrette makes a great condiment and substitution for mayo or ketchup as well as a delicious salad dressing. Store in an airtight container in the fridge for up to a week. Paul did AWESOME, right!!! Remember take part in vegicating with someone your love today before they vegicate themselves. Apparently a good black radish is hard to find in the good US of A. So, I was shocked when I stumbled across the Tyson Beckford of black radishes. Plump, dark and ready to sliced into or ravished whole. Sorry, Tyson oops I mean radishes get me excited. 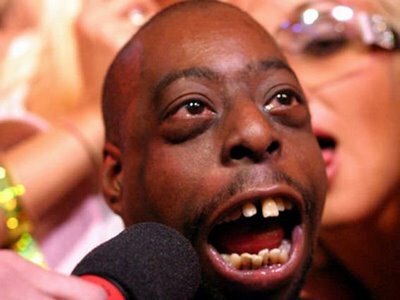 Alright, I know what you might be saying Tyson Beckford, no way this thing looks like BeetleJuice from the Stern Show. Shucks, give him a try he is one tasty veggie…. While the black radish is popular in eastern European kitchens, it gets about as much attention as its cousin the daikon here in the USA. ( What, you have never heard of daikon – right – so you get my point). If you are familiar with the reddish radishes that make their way into many restaurant salads this radish is not very far off. 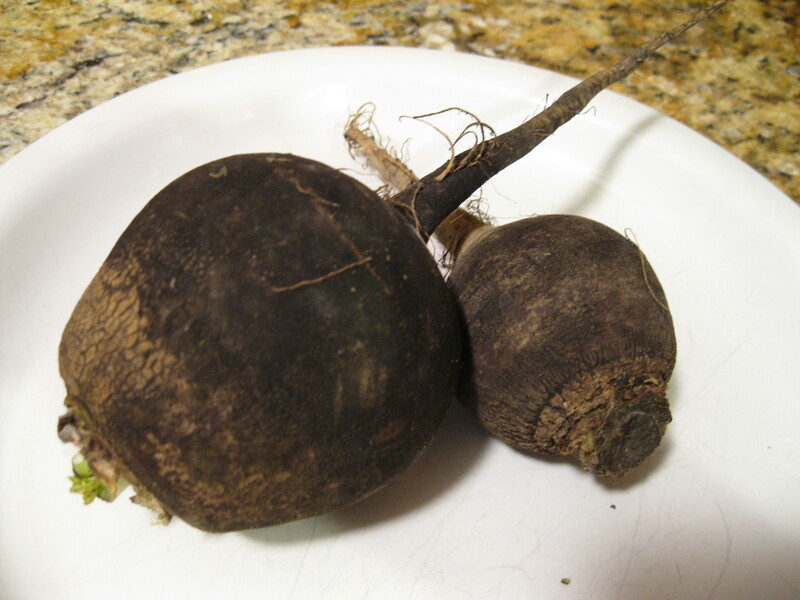 The black radish, while bigger and a bit furry, is much milder in flavor then the red radish. The red guys often have that almost unbearable peppery bite to them. If you like radishes, give a black one a try. You know the saying ladies – once you go black, you never go back. (Tyson baby call me, wink, wink). Now for a recipe. I was going to try radish chips but they usually come out a bit soggy and undesirable. 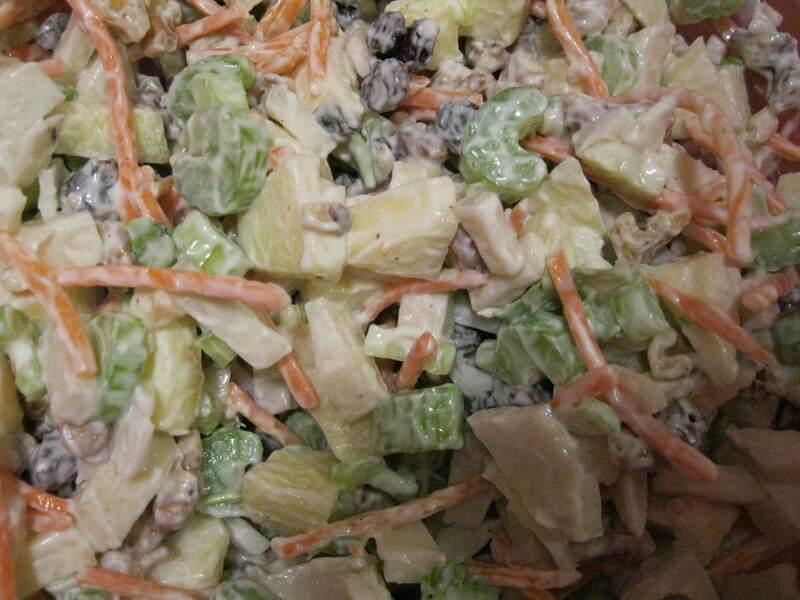 So, I felt like going for my own take on a bit of a Waldorf Salad. Combine Ingredients 1-12, toss together in large mixing bowl. Serve over romaine lettuce leaves. Hands Off The Can Opener!! Ok, first let me apologize for posting my pledge to blog once a week and then totally blowing you all off. I hope that you did not have to resort to canned green beans or those awful frozen square carrots, peas and corn. If you did I will be available for veggie-therapy February 29 between noon and 1 with and hour lunch break from 12pm-1pm. Call my admin to book your appointment. A good excuse? Of course I had one. Now what was it….hmm. No, all kidding aside last week was really great. We planned a fundraiser through work for the victims of all the natural disasters in Australia – floods, cyclones and now more bush fires. Our event was on Saturday in a cool little pub in Manhattan called the Parlour Midtown. We had raffle baskets, silent auctions and a 50/50 and made over $8,000 for the Premier’s Disaster Relief Fund. Check out the pictures, here. So, yes I do apologize but it was for a very good cause. On that note, I will be back to the posts with Black Radishes this week so take your hands off the can opener and put your eyes on your email.